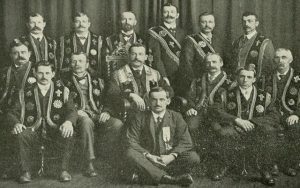 Fraternal organizations are not as commonplace for most people today as they were back in the mid-1800s on through the twentieth century. Our ancestors joined these groups for camaraderie, financial support regarding burials, insurance, and more. There were hundreds of such organizations, some of which popped up for just a brief few years. In August, I had an opportunity to give a webinar for the New England Historic Genealogical Society in regard to these groups. We discussed determining organizations of which an ancestor might have been a member based on acronyms or insignias on tombstones, jewelry, papers, and other ephemera, and then how to find additional information about an ancestor, including records, as a result. The most important piece of information beyond the exact fraternal group, though, is the local organization. They go by many names. The webinar was just an hour long, which was like the tip of the iceberg. There is so much information about these groups and so many places one needs to look to identify a group, especially when all you have to go on is, perhaps, the acronym or a lodge name. The most important piece of information beyond the exact fraternal group, though, is the local organization. They go by many names. Masons have lodges. The Grand Army of the Republic had posts. The Sons of Temperance had divisions. The Knights of Columbus have courts. The Improved Order of Red Men have wigwams. Finding these local groups can best be done by using newspapers and city directories for the years in question. Many newspapers carry small announcements of newly elected officers, the formation of new lodges, etc., and the deaths of members. There is something fascinating about these organizations, as they catered to religious beliefs, ethnicities, occupations, and more. It is sad that, in a country that has more people than ever before, many of the last surviving organizations are seeing their numbers dwindle. If your ancestor was a member of any of these groups, you may want to take an hour and listen to the webinar: Fraternally Yours, Finding Your Ancestor in American Fraternal Organization Records. Another book to keep a look out for as a used book to purchase is Alan Axelrod’s The International Encyclopedia of Secret Societies & Fraternal Orders, as this gives a lot of information on many organizations and describes the differences in scope and purpose. Keep in mind that the records of these organizations are private records and not all organizations are willing to share. However, there are a number of digitized collections on AmericanAncestors.org, Ancestry.com, and FamilySearch.org now. I found a photo of my grandfather in lodge attire (he lived in Scotland) and I thought he must have been a Mason. Via a Scottish relative I was able to learn, to my surprise, that he was a member of the “Ancient Order of Free Gardeners” in the early 1900s. I believe they paid for his headstone when he died and maybe gave my grandmother a little money. 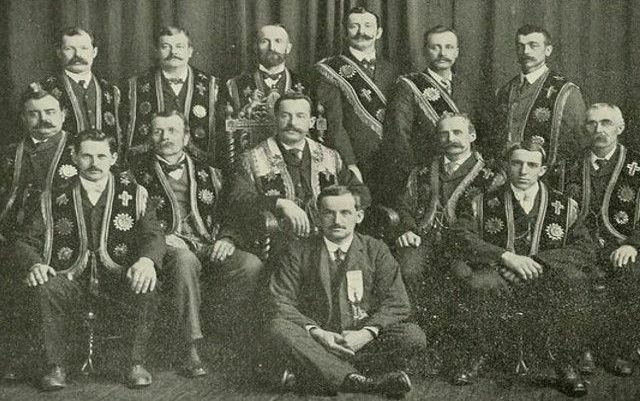 What was interesting, when I looked more closely at the photo, is that in addition to their masonic-looking attire, they all sported a flower on their lapel. In finding a newspaper mention of the group, I learned he belonged to the “Vine Blossom Lodge.” All of this said, I don’t know that they were gardeners. Thanks for the reminder, Rhonda. I was unable to watch the webinar because of a prior commitment, but thought that it might prove useful for some of my lines, particularly on my mother’s side, which I am just beginning to explore in depth. My mother was a member of the Order of the Eastern Star, and her sibs belonged to other organizations, including the Odd Fellows and the Masons. This suggests that earlier family members likely did too. August is always busy for me, and I’d let the webinar slip. Your post reminded me, and it is on my calendar to watch once I finish stacking this winter’s firewood in the barn! Grandma and Grandpa Warner belonged to “The Grange”. In rural areas it was “the” social and business organization. Following a disaster, fire or death, they were the first on the scene to render assistance. All but gone now as Grange after Grange slipped away with the small farmer. From a religious standpoint. My wife reminds me that many Lutheran Fraternal organizations have come and gone, especially in the midwest. The Walther League was a mainstay in the US until the theological schism of the Lutheran Church, Seminex, occurred. Lutheran Layman’s League was a powerhouse but is a shadow if itself. Lutheran Brotherhood and Aid Association for Lutherans merged to become today’s Thrivent which doubles as selling financial products and having a social aspect. Many of these groups were the heartbeat of local congregations. The Minnesota Historical Society maintains, as a National Historic Landmark and “the birthplace of organized agriculture in America,” the Oliver Kelley Farm on the Mississippi near Elk River, Minnesota. Oliver Kelley was a primary founder of the National Grange of the Order of the Patrons of Husbandry, better known as the Grange, the first successful national farming organization. It is worthy of note that women were included as voting members from its inception in 1867. Thus, this year is its 150th anniversary. I was able to find the birth date of my great grandfather and his actual birthplace on his Masons card on Ancestry.com. For years we thought he was born in Lugano, Switzerland but his Masons card listed Locarno, Switzerland. This is the first place I found that listed his birth date and birthplace recorded by him.